Video here. I found it quite impressive. If you're in a hurry, skip ahead to about 6:00, where the really interesting material begins. UPDATE: via the UK's Daily Mail, here's a closeup of Hillary's "stumble" on 9/11. It looks like anything but a simple stumble. An aide stands to her left, with a good grip on her arm, as if expecting something to happen. First her back arches repeatedly, as if going into some manner of seizure. Then two other aides grabs her torso and her other arm and the three try to move her forward. Then she goes limp and flops down. UPDATE: here's more from the same doctor, regarding her 9/11 episode. He points out that, on overcast day, she was wearing sunglasses, in a strange blue shade that I've never seen before, and he says that such glasses are used by Parkinson's patients to suppress muscle dis-coordination. I checked, he's right, here's a webpage selling them for just that purpose, and in the same bright blue shade as the glass she was wearing. And while we're on glasses, let's talk prism glasses, such as such as Hillary wore a while back. While they can be necessary after a concussion causes double vision, they're also used for some Parkinson's patients. 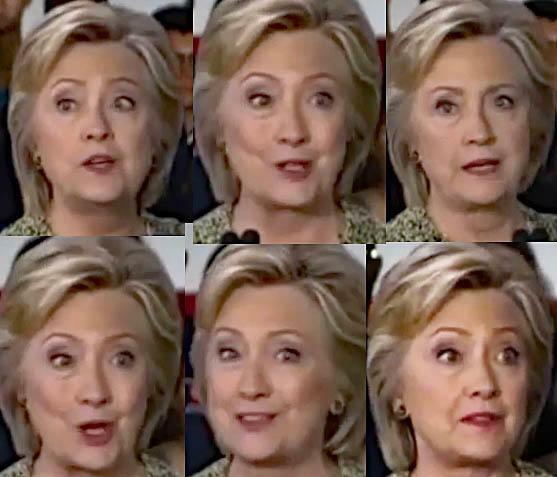 FURTHER UPDATE: This page asks what is going on with Hillary's eyes during a recent speech. I couldn't see it in the video, but when I viewed it frame by frame it was apparent. Often one eye will be looking more or less straight ahead, and the other be set at an extreme left or right position. It happens when she swings her head. One eye seems to find its new target, while the other eye lags behind and takes a while to catch up. It turns out this, too, is a symptom of Parkinson's. "In Parkinson's disease, the saccades [eye movements to aim at a new target] tend to be slow (or hypometric) and show delayed initiation. Some people with PD require a blink to change their saccadic position (this is called Wilson's sign)." Her symptoms are unusually quiet for Parkinsons, but she could have another long term ailment. This should affect undecideds, but not partisans who vote for a ticket regardless of crimes or politics. The most outrageous response to Hillary's illness is, "I'd rather vote for a dead Hillary, than a live Trump." Careful what you wish for is my usual reply. All bets are off if she lives past the ballot deadlines, then dies before the election. At best, many Democrats wouldn't vote. If she gets elected after she dies, or dies after she wins, then that pesky Electoral College that all the leftists want to ban gets to debate and choose, if I got it right. Constitutionally the members of the Electoral College get to decide who they believe is the best President. The farce everyone participates in is not Constitutional. The state legislatures get to come up with the method of choosing the Electors BUT the Electors are supposed to meet in their own State and make THEIR choice(s) for President. The extra-constitutional binding of the popular vote is not part of the system of government. The Framers discussed allowing the People to choose the President and determined that the People were not wise enough to do so. The parties stepped in and destroyed the plan along with the system of government the Framers had attempted to create for us.